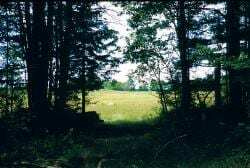 Purinton Homestead Conservation Area, an undeveloped and traditional rural agrarian and forest preserve in the village of West Bowdoin, was generously donated to the Androscoggin Land Trust in 2001 by the Purinton Family. The Preserve includes a 40-acre field and 100 acres of woods with frontage along Gillespie Brook owned by ALT as well as the privately-owned historic Purinton family home and adjacent 9-acres which ALT holds a conservation easement on. ALT also holds a conservation easement on 2 adjacent acres owned by the West Bowdoin Cemetery Association. With the red brick West Bowdoin Baptist Church and an iron-gated cemetery next to the preserve, it is an oasis of the 19th century. The bricks for both of these buildings were made from clay found on site by Nathanial Purinton and his son Albert. Hay is still being harvested from the fields. Gillespie Brook, empties into Little River which is good potential salmon habitat. Motorized usage is prohibited. The house and adjacent 9-acres is privately owned and not open to the public. Directions: Follow Route 196 in Lewiston north to the intersection with South Lisbon Road in Lewiston. Turn left onto South Lisbon Road and follow to intersection with Crowley Road. Turn left onto Crowley Road and follow until the Town of Sabattus where it turns to Bowdoinham Road. Continue on Bowdoinham Road until you cross into the Town of Lisbon where it becomes the Store Road. At the intersection with West Road, turn left onto West Road and follow past the field on the right. When the fields turn to woods again, look for a sandy informal parking area on the right, which is adjacent to the trailhead.